“Selbst – im weitesten Sinne” 2003, Marburger Kunstverein e.V. 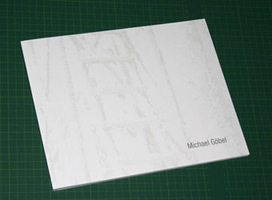 With this quotation Michael Göbel refers to the vital issues of his pieces of work: the relationship between the individual and society, the controversy of individu­ality and conformity, the relationship between privacy and publicity, and least but not last the question about the origin of identity. The definition of identity derives from the Latin word idem “the same”. Initially this signifies a harmony of something within itself. Creating identity includes all these actions which form a subject and its ability to express itself within a social context. According to the art historian Stuart Hall’s theses, identity is no homogenous concept but rather an intersection, the result of the tensions between ideological and psychological actions. Therefore identity cannot be regarded as an internal truth but is subject to continuously modifiable coincidences. Despite of its elusive quality the subject has to use attitudes or a frame of mind which we call identity to remain capable of action. These attitudes have a specific history and depend on a constant contest with the environment and itself. Which criteria are there playing a major role in the process of identity formation? Which poises do we adopt and how do we express them? How do opinions come about and how independent are they? 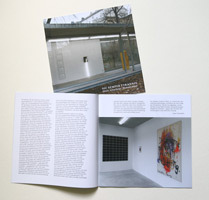 Analysing these questions are the key issues of Michael Göbel’s photos, drawings and sculptures. The presentation of different materials is always entangled in regard to content and is often put together as installation. The artist’s sculptures are downsized readjusted reconstructions of given facts being based on exact photographic research. With these downsized scenario and models he ironically challenges the social valences and the status symbols and tries to get to the bottom of the problem in the sense of opinions or viewpoints. His working methods are shaped by alternating between interior and exterior view, between public places, as well as private sanctuaries concerning their respective importance. Your own house, own place of residence i.e. your home is traditionally a place that has been formed individually by its respective residents. There you set up according to your own taste and fulfil your ideas about cosiness, functionality and comfort. The sculpture Zuhause (Home) (2002) was crafted in a scale of 1 to 32 and is floating in space like a Fata Morgana. It broaches the issue of this collective (German) dream of a privately owned home. You can see a standardized prefabricated house with closed shutters and attached satellite dish. It is surrounded by a garden fence and shows the compulsive additions: swing, barbeque, rotary clothes dryer, and a carport sheltering the BMW estate car. The ensemble is made of plaster, wood and cardboard and is uniformly dyed with a green beige RAL matt varnish, almost virtually uniformed. With this washable clean finish this miniature sculpture is turned into a cynical cartoon concerning its pledges. The same happens to the interior equipment of these privately owned homes which the artist displays in various works. The series Bedrooms (2007) consists of marker drawings showing the interior of various bedrooms. Each room is furnished with a bed, (properly made with bedspread and ornamental cushion) a bedside table, and a small chest of drawers. There are curtains on the windows and pictures on the walls. The arrangements differentiate only in a few details and do not tolerate any conclusions concerning the respective inhabitant’s personality. These drawings do not give any kind of real information nor do they boost any knowledge. By this orchestration it is out of the question to get to know the true identity of another person, because an image of the real person cannot be developed. We are just seeing a representation. The sculptures Storage I + II (2008) however are downsized wall units or something like that which you can find in numerous sitting rooms. Erected for the purpose of storage they are also meant to be as prestigious as possible. Even if they differ in their respective designs – Gelsenkirchen Baroque or a copy of the Bauhaus style – they are all a synonym of the main stream taste in changing times as well as the conformity in our home furniture. Kathedralen (Cathedrals) (2001) are an ensemble of nine different pieces of seating furniture en miniature: a folding chair, a barstool, a cantilever chair according to Marcel Breuer, an office chair, a variety of dining-room and kitchen chairs, a rocking chair, and the stackable garden chair “Memphis”. Each chair is placed on a pedestal and illuminated by a spot light thus functioning as icons of the modern history of design. Their homogenous white colour robs them of any characteristic feature. The setup in a circle is like an indefinite loop: an endless recurring reproduction of always the same. Hotels form a kind of interspaces between private and public zones. Clinical and function orientated, uniform, and only recognizable in their respective hotel outfits they reassure the guest to feel at home. 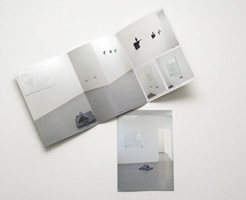 In contrast to his later sculptures Michael Göbel brought a real object in Sauerland Pension (Sauerland boarding­house) (2000) into the equation. This work consists of two pillows with an accurate dent and is displayed on a wooden shelf. Since they are missing their casings it is still possible to recognise the signs of wear and tear evoked by the former user. The things that are only visible to the respective tenant (and the chamber maid) in the seclusion of a hotel room is publicly shown here although they do not give any insight. Only the forensic science could give reliable information about anything specific according to the traces. Anonymity is still granted. The installation Endlich allein (Lonely at last) (2008) shows that not only our private life but even our leisure time activities are standardised. Three pedestals are piled on a bench forming a kind of abstract moun­tainous landscape. A small lonely human figure is placed on top looking into the distance. Right next to this display are the relics of a burnt down camp fire, fixed on a precious cherry wood board. In contradiction to this assembly there are two marker drawings of anonymous tower block settlements. The desire to break away from our daily routine is matched with the stereotype romantic idea of outdoor life, freedom, adventure, unrivalled experiences. Wishful thinking of a saturated society that is quite aware of its conformity and whose dreams are generated and operated in the long run by gigantic commercial machinery. The absurdity of these dreams has been broached in his piece of work Am Strand (Beachfront) (2005) picking on the phenomena of mass tourism. A complete bluish turquoise holiday resort has been erected on a board of two metres in diameter. Behind a bulky hotel surrounded by balconies is a scenery of pools em­bellished by palm trees, deckchairs, parasols, a bar and a path to the beach. Here the paradox between the relationship of individuality and conformity very de­scriptively got to the point. The most precious time of the year, your holidays, which are supposed to be something special and extraordinary is being spent as a package tourist. Michael Göbel also dealt with the topic leisure time in other works i.e. in a serial of drawings called Luna Park. With a light grey graphic marker he reproduced various stalls and fun rides in clear and delicate hachure not giving away any individual style. The entity of these designs is only perceptible from afar. Moving closer the forms start to disintegrate and get transparent nearly lucent. The anonymity of the subject is reinforced by the complete absence of people. Without visitors these places stay a mere décor and reveal their character as projection areas. The design model for the sculpture Deadlock (Prypjat) (2009) also derives from such a park. It is a big wheel that had been erected in the leisure park of the Russian town Prypjat. The park’s opening was scheduled for May 1st, 1986 but didn’t take place due to the nuclear reactor disaster in the close by nuclear power plant of Tschernobyl in April of the same year. Frozen and like being set in concrete in the wall and floor of the exhibition hall this fragment explains the worst case scenario, the intrusion of reality we want to escape from in these settings and this seems like the expulsion from paradise. The permanent confrontation with this reality surrounding us, the observation of others playing an important part in shaping our identity has been impressively analysed in his piece of work Hochstände (High Seats) (2007). Everybody knows these weird shapes in the landscape offering their users the possibility of observation without being monitored. In English they are also called Raised Hides meaning high-up hideaways. A high seat is a place from which a certain geographic area can be surveyed but at the same time the observer is being sheltered from outside gazes and thus granted a kind of anonymity in the open space. Downsized to a scale of 1 to 6, dyed homogenously in pink and placed on tiled pedestals these miniature sculptures are turned into stereotypes of their original task because the line of vision is being reversed. Curiosity, voyeuristic pleasures, and the idea of surveillance are documented in this piece of art and thus reduced to absurdity. How much publicity can privacy take and vice versa? Which insights do we permit and which are we granted? Is there something like singularity or is our behaviour and feeling completely moulded by standards and traditions of our society? For Michael Göbel this contradiction is not at stake. The artist classifies that this theme is the individual person trying to stand out from the crowd and he also states that his can only function within the society and its codes. “In my pieces of work I always see the person but then in fact he hardly ever shows up” is the way he describes his work methods. In his works it is the traces everybody leaves somewhere that have to be detected eventually. Michael Göbel’s works seem to be bringing the fact home that our conceptions apprehended individually and subjectively are actually appallingly homogenous. His humoristic and ironic approach reveals that our desire for uniqueness has failed. But a little bit of hope still remains. Villages displayed in the landscape resemble small lakes and are energized by roads and lanes. According to the people living there you could also speak of islands. They settled on this piece of land and started building a community. They could be together there and could also be protected from the outside world. The residents of these islands, however, also built their own little islands or hideaways where they could retire to and were sheltered from views and access of other people. Within these hideaways, however, separated or only accessible by stairs you can find even smaller sanctuaries such as a small private room where he/she can be completely on his/her own. Continuing this walk you get to the furniture and finally the clothes and minds – alert or asleep. “No man is an island” is a proverb. At the beginning of the 17th century the poet and preacher John Donne wrote this sentence and elaborated on it. “Every man is a piece of the continent, a part of the main, if a clod be washed away by the sea, Europe is the less. Any man’s death diminishes me, because I’m involved in mankind.” He wanted to emphasize the importance of each single person within the community and his/her commitment there. Nevertheless limits are also required. At least this is how Michael Göbel feels about this. He spent 3 months in the small village Willingshausen in the Schwalm where he had been granted a stipend covering his living and labour expenses. He called his exhibition in the local exhibition hall quite ambiguously Islands. In this exhibition Michael Göbel shows fences, hedges, and gates separating the concerning premises and courtyards. It is difficult to distinguish between the ‘From where’ and ‘Where to’ regarding the flight of stairs he displays. He also reveals illuminated windows at night which draw curious glances like moths to the flame. On his invitation card as well as his poster Michael Göbel shows himself as a stranger approaching the village. With his yellow cagoule this is like being rigged up into an ancient black and white postcard. These photos are basically all strictly documentary photos. They seize the action emotionlessly and precisely. But they still allow the photographer to show his motivation “to see something” due to his specific detailed visual design, his line of vision, and perspective distortion. The images, however, block the observer’s view and make him/her realize that he/she is still on the outside and actually cannot and is not to see anything. Michael Göbel used those photos of the various separations in the village as a guide-line for his large-sized drawings. These, however, don’t reproduce the photos with their colourful variety but were done in a nearly invisible grey. Using a marker he turns them without any obtrusiveness into a hachure as though the walls and their natural cover resisted the visibility and actual appearance. The themes melt into a graphic effect and thus transform the picture into a picture of the picture. Michael Göbel also interpreted the photos of the staircases by reducing them to a simple chiaroscuro and etched this onto glass plates. You have to find a certain angle to clearly experience them at all. When walking up very closely to those plates the picture dissolves into hardly significant opal and shiny areas. Looking at them from a distance again these pictures seem to be a colourless optical reflection on a window also limiting the curious view. And finally the luminous spots in the dark night, i.e. the windows ablaze with lights. They, too, do not grant any insight. Nobody is to be seen and only the periphery of the privacy is illuminated: the curtains and decoration as an indirect statement and minimized link to the inhabitants. Thus these windows, staircases and barriers give the impression of being more than a mere theme especially within the artistic processing. The theme is turned into a metaphor by which the reserved objectivity is being personalized. Here the question arises about mankind and his attitude and about the observer’s viewpoint and projections – this being the case despite or because of the obstacles having been put into the observer’s way. The centre piece of the exhibition was the propped up dance floor which got to the heart of the picture by being objective and realistic. This dance floor with its lampions rises above the hustle and bustle of a village fête – representing an island as well and also inviting to cheerful dancing and hilarious and tender together­ness. But then it is already night and the dance floor in a dark blue shade is empty again, and has shrivelled to half of its size and has partly disappeared into a wall. This image – something like this or on principle – is like an afterthought, a memory of something that has turned into something of the past.